Homeopathy is most popular amongst children for its efficacy, safety and easy acceptance. 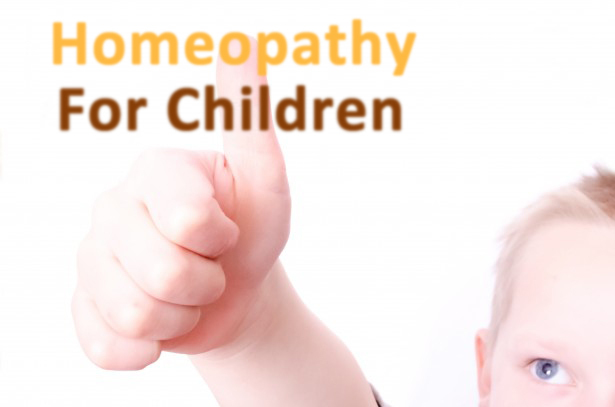 Homeopathy is used and preferred by many pediatricians (children specialists) in India. Homeopathy is a science, which deals with curing the patient on the principle of “Similia Similibus Curentre.” This means “Likes cures Likes.” It is a science where extremely minute doses of medicines are used for the treatment of the disease condition. Children are very delicate and sensitive both physically and mentally. Their body cannot tolerate very heavy dosages of medicines which can produce toxic side effects. There are many reasons why homeopathy should be given to children for treating disease condition in children. Homeopathic medicines are extremely safe: Homeopathic medicines are produced by putting the crude form of a substance through a special process called trituration and potentization. After the completion of these processes the crude substance is converted into a homeopathic medicine. In this manner homeopathic medicines are prepared from plants, herbs, minerals and certain refined chemicals. No fear of side effects: Homeopathic medicines can be continued for a long period of time without the fear of toxic side effects on vital organs. Homeopathic medicines can act as immune-corrective and immune-booster: Children are known to have a low immunity and resistance power to fight against harmful germs. This is the reason they frequently fall sick. Homeopathic medicines when given to the children can boost up their immunity and resistance power thus making them strong to fight against powerful germs. These medicines protect the children against many infectious diseases and prevent frequent illness in them. Homeopathic medicines are quick and very effective: Children being delicate and sensitive respond very quickly to the homeopathic medicines. Homeopathic medicines offer good results on many frequent and recurrent diseases of childhood. Following diseases in children can be treated very well with homeopathy. Respiratory system: Children are prone to frequent attacks of Cold, Tonsillitis, Ear infection or Otitis media, Bronchitis, Bronchial asthma, Adenoids etc. In Bronchial asthma homeopathic medicines give wonderful results. These medicines reduce both severity and frequency of attacks and increase immunity of the children. Gastrointestinal system: Children get easily affected by diarrhea, constipation and gas problems. Due to this they experience loss of hunger or decreased hunger. They refuse to eat and this can have an adverse effect on their growth; both physical and intellectual growth. Homeopathic medicines can correct the digestion and help in overall growth and development of the children. Homeopathy has also very good results to offer in diseases like Hepatitis B and Hepatitis C.
Skin, hair and nails: Diseases of skin such as Eczema, Urticaria, Psoriasis, Vitiligo, Lichen Planus, recurrent Fungal infections, Warts, Hair fall and Alopecia areata etc. can be treated very well with the help of homeopathy. Conventionally, most of the diseases described above are merely controlled by administering heavy doses of steroids. Repeated doses of steroids not only make the disease more difficult to treat but also give rise to dangerous side effects in children. Thus, homeopathic medicines are most suitable to treat above conditions. Mind and intellectual level: Homeopathy is strongly suggested for Autism, dyslexia, Attention Deficit Hyperactive Disorder (ADHD) etc. Conventional medicines have very limited roles in treating above disease condition. Urinary system: Diseases like Nephrotic Syndrome can be very well controlled by homeopathy. Homeopathic medicines can facilitate easy removal of small unimpacted stones from kidney, ureter and bladder. Recurrent styes in children can be treated very well with homeopathy. Same way process of dentition in children can be made very smooth and easy by giving homeopathic medicines to children aged between 5 months to 12 months, a time period during which the teeth start erupting in children. Limitations of homeopathy: Homeopathic medicines do not help in an acute and very critical disease conditions like Tuberculosis, Typhoid, Malaria, Meningitis, Rheumatic fever, septicemia etc.Homeopathy does not offer any scope in reversing Mental retardation.In certain diseases where the surgical intervention is only the answer; like hernia, cataract, optic atrophy and certain cancers homeopathy does not help much.